At the end of the year 2012, the paper "Secure stadium experience" was introduced into German football. While this package of measures is into its second season now, we would like to see how our European neighbours handle the topic of security in football. For the start of this series, we took a look at Austria. In the second text, we set our eyes on how things are in Turkey. The original article was published on our German site and then translated by Nadja. „Hey Oguzhan, if the stadium is sold-out, we'll win the derby!" "Do you have a PassoLig card, Tolga?" "No, we are the players!" "I know, but our fans have to buy a card to see the derby?!" "That's easy. If they go shopping in our fan shop, they will get the card for free." It was supposed to be a well-meant try, but the – admittedly badly prepared – promo campaign turned into a boomerang and is still a running gag among the Besiktas fans. Just before the derby between Besiktas and Fenerbahce, two games before the end of the season 2013/2014, the so-called eBilet era started in the Turkish Süper Lig. eBilet is the latest thing of the Turkish association: football fans need an electronic ticket to visit games in the professional leagues. To buy an electronic ticket, one needs a PassoLig subscription: a client card with all personal data – including a biometric photo and the PassoLig card can also be used as a credit card. The association – and even more the state – wants to act preventively against the violence in Turkish football stadia with it. So the idea was born to make the stadium visitor transparent. It didn't come as a surprise that the retailer of the PassoLig cards coincidentally is a business man with links to the association and it didn't increase the anticipation for this regulation. On the contrary: as the Besiktas promotion shows, the clubs had to pull out all the stops to win the fans over and to make buying the PassoLig card tempting for the fans. But the fans didn't come. They protested against this arbitrary approach of the association, the state and the clubs. They didn't want to become crystalline and pay for it. Besiktas and the association got their comeuppance in the derby against Fenerbahce, for example. Not even 10'000 spectators saw the indicatory game – it would have been 80'000 if the club would have sold normal tickets. eBilet is the last episode of the unsuccessful relationship between the Turkish association and the fans. It is already common for years that in derbies between Fenerbahce, Besiktas and Galatasaray as well as in games of the Istanbul clubs against Trabzonspor there are no away supporters because these games are classified as risk games. Also Bursaspor have been admitted to the illustrious circle in the meantime. 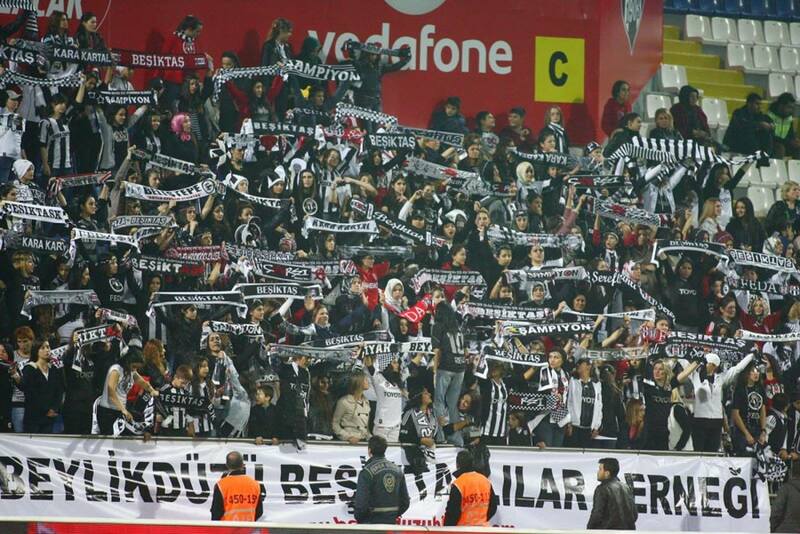 The fans of the crocodiles are not allowed to travel to, for example, Besiktas. The away stands are completely empty in these games, but still the police forces are increased clearly. The same regulation is also in place for games between Besiktas and Bursaspor because the fans are at enmity and there has been heavy rioting. Another curse are the constant expulsion of spectators in the league: the association is regularly excluding spectators when a guard noted "indecent behaviour" of the fans. In case of repetition, the association is automatically banning all spectators. For all later repetitions, the penalty is doubled. Banning spectators means that no men are allowed in the stadium. Only women and children until the age of 12 may attend the game. In the beginning this had some charm when Fenerbahce attracted 50'000 women and children, but it's becoming more of a burden as the association is imposing the penalties almost arbitrary. Fenerbahce will have to play their first three games of the next season in front of women and children because of some penalties. The Süper Lig might be the most away supporter hostile league in the world. The biggest issue is the short notice of scheduling: it can happen that only the Monday before the next games, the schedule is announced. Long term planning is seldom. The bigger clubs have the advantage to have a lot of fans spread over the whole country and that they don't need the support from Istanbul, for example. 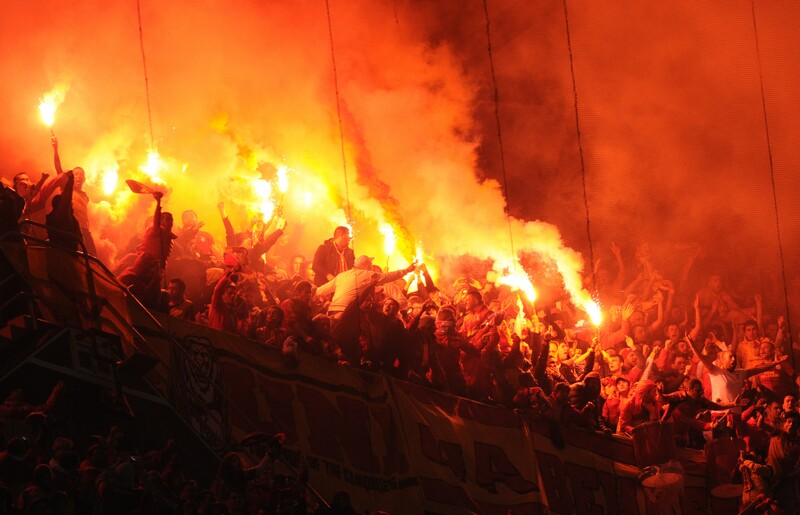 If Galatasaray plays in Gaziantep, the fans on site organize themselves and fill the away stand. For smaller clubs, this is not that easy so that the support for them is often quite limited. If the Istanbul fans still travel through the country, the clubs support their fans with sponsored coaches. Sure some groups of fans have a share in this approach of the functionaries – and maybe even in the measures as eBilet and spectator bans. During a long time, the Turkish football had a violence problem – especially derbies became a showdown of competing fan groups. For many, it didn't matter what was happening on the pitch, as long as one won on the stands. 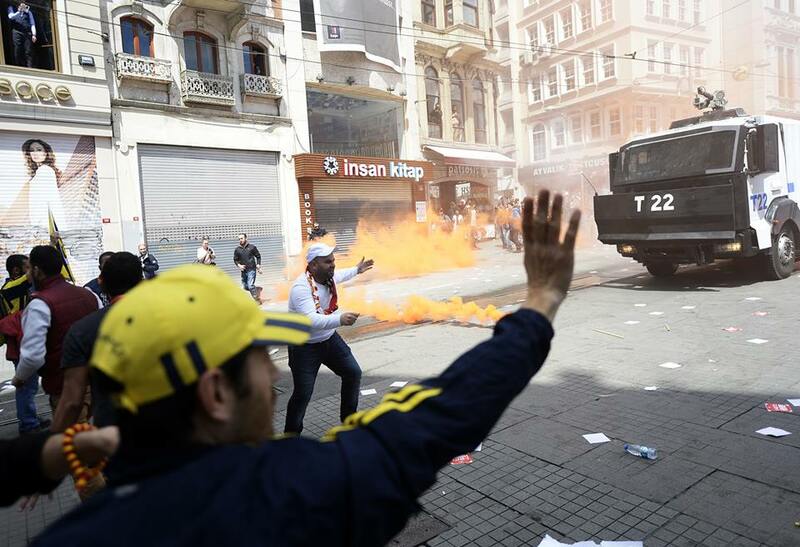 The potential for violence is present, even if hooliganism isn't as organized in Turkey as it is, for example, in England, the Netherlands or Germany. There are more random situations in which problems around the stadia emerge. Violence against innocent bystanders is quite seldom, but vandalism is an issue. Most recent example: during the championship celebrations of Fenerbahce, unidentified fans demolished a closed fan shop of Galatasaray and burnt the articles. Without any reason. Just as in Germany, pyrotechnics are forbidden in Turkey, but common in every stadium and hardly punished. The media don't criticize it – on the contrary. The pictures are used to stoke up the sphere. Also the clubs sooth their clips on their own channels with pictures of pyrotechnics. For using pyrotechnics, there are only fines – if any. But one has to say that the situation has improved a lot the past years. The building of many modern arenas has let the air become thin for many violent fans. Also the establishment of well-organized Ultra groups has had a positive effect as the fans are more actively in dialog. Clubs recognize the Ultra groups as direct contact and often involve them in approaches and projects. A good example is Galatasaray where for many years there have been a member of the board caring about fan issues and keeping direct contact to the group „ultrAslan". ultrAslan leaders have a hotline with the club direction and therewith also a friendly ear. That is part of the returning critic, but it also gives a mutual benefit. Galatasaray has a lot less issues, the fans have a lot more influence. Also the media is noticing: quite frequently, the Ultra bosses are direct contacts in topics around the fan situation. The Ultra bosses of Galatasaray, Fenerbahce and Besiktas are known among the football fans. The problem has shifted in the past years: it's not the fans that fight among each other. It's more the authorities' forces such as the police that the fan groups have in front of them as direct opponents. That's why fights with the police have been quite regular in the past, reports of exaggerated operations of the police became public. Involuntarily the authorities are making for the competing fans to unite. From the view of the fans, the politicians are the driving force behind the massive regulations and use the association as henchmen. President of the association, Yildirim Demirören is a business men with close ties to the government who discusses many of his decisions directly with the government. Also sporting decisions are in the meantime made in this way: the appointment of Fatih Terim as national coach was made after the head of government, Recep Tayyip Erdogan had asked Terim at a dinner during an event to help the Turkish football. The association had understood the hint and made Terim an offer. A turning point was the Gezi movement that started on 31st of May 2013. It all began with a peaceful protest against the intention of the Turkish government to build a shopping mall at the place of the Gezi park, one of the only public green areas that have survived in the city centre of Istanbul. A shopping mall of many that the city, following the opinion of many citizens, doesn't need. The number of oversized shopping malls is increasing regularly in Istanbul. Many of them are empty again shortly after the opening, because there are just too many of them. To avoid this danger for the Gezi park, the protests started. When the police used brutal violence on the 31st May 2013, the demonstration turned into one of the biggest mass movements of the younger Turkish history. It went on for days and even claimed lives. These days brought the fan groups even closer together. The resistance won such a enormity that even the supporters of the three Istanbul top clubs Besiktas, Fenerbahce and Galatasaray closed ranks. They called themselves "Istanbul United" and wore a flag that was composed of the logos of the clubs. They protested side by side and still have a close relationship. There was even a movie made. "I left the house in the morning with a Fenerbahce shirt and came back in the evening with a Galatasaray scarve. ", one Fenerbahce fan twittered. The infamous "Carsi" group, the Ultras of Besiktas, hijacked a "toma", a tank of the Istanbul police. There are legends on the internet that Carsi members requested on the radio the police to sing a battle call of the club. That even impressed the rivals. Galatasaray shirts with the Carsi logo became bestsellers among the resistance. "You failed, the fans did it", the sport newspaper "AMK" headlined and directed towards the presidents of the Istanbul clubs and president of the association, Yildirim Demirören, who only half-heartedly fought the violence in football. The "AMK" goes on to say "They are one heart and they fight together for their rights". The picture underneath showed three competing fans that lead a protest march on the Bosporus bridge. One of the most impressive moments of the movement was the highlight of the unheard-of fraternization of the groups. "We have Drogba. They don't" was written (in English) on a huge poster that hang at the outside of the Atatürk cultural centre at the Taksim square. A football fan in a Fenerbahce shirt took care of the difficult affixing and was celebrated like a hero. Even if the situation normalized since and the fans show the usual rivalry again, the talking has become a lot easier and the fans are aligned much faster than in the past. However, fractions are building within the fan groups. Supporters of the government and opposition members are fighting their fights within the clubs Besiktas, Galatasaray and Fenerbahce. The biggest fan group within Fenerbahce, GencFenerbahceliler is at dagger drawn with the directorate. The author: Fatih Demireli lives in Munich and works for the sport portal spox.com.